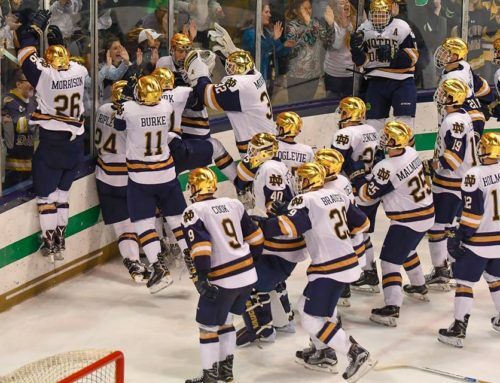 Notre Dame hockey will play for a national championship tomorrow night thanks to yet another heart-stopping victory in what’s become a spring full of them last night. 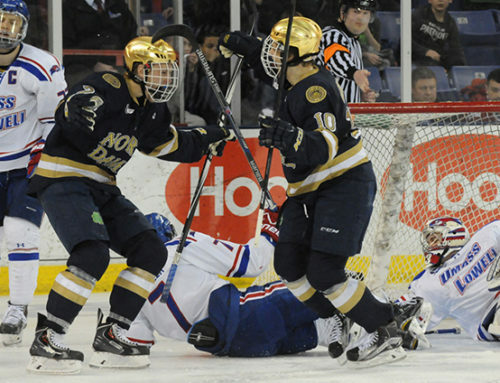 The Irish’s Jake Evans scored the winning goal with 5.2 seconds to go to give ND a 4-3 win over Michigan. 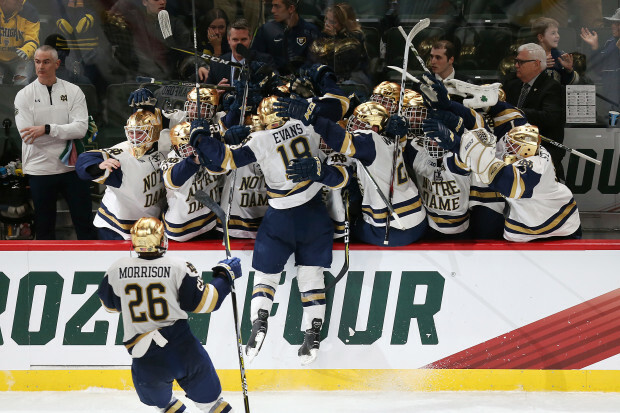 That sends ND on to the finals in St. Paul, which will be a virtual road game against Minnesota-Duluth, who beat Ohio State in the other semifinal. Evans beautifully manages to maneuver the puck between the Michigan defender’s legs AND those of the netminder to win it. It’s insane. The Irish trailed 2-0 after the Wolverines put in a goal 17 seconds into the second period before igniting. Andrew Oglevie scored on the power play just a couple of minutes after UM went up by two, and Evans sniped one from the blue line a couple of minutes after that to tie things up. 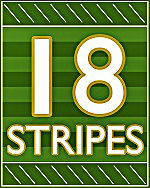 From then on, the Irish dominated the period, although they didn’t score again. The score stayed tied into the third, when Dylan Malmquist snagged a loose puck out of a face-off, bolted to the other side of the rink and fed Cal Burke for a beautiful goal that made it 3-2 ND. However, Michigan attacked the net relentlessly the rest of the period and scored a game-tying goal with five minutes to go. Only some tremendous play by the national goaltender of the year, Cale Morris, prevented Michigan from winning the game. ND’s final goal is the stuff of legends. Many of us fans were probably resigned to overtime when the Irish finally gained possession of the puck in their own end with 12 seconds to go. Cam Morrison and Evans were not, and laser-beamed to the other end, similar to the Malmquist/Burke play from earlier in the period, setting up Evans’ Houdini goal. There’s only one more nail-biter left in this crazy Notre Dame spring. Shall we end it with another title? Great article, Andy, this team sure does have that knack to find a way. One more to go, and I don’t really know what to make of Duluth. They got beat by Denver every time this year and North Dakota beat them recently too. And with due respect, their Frozen Four path on paper (Minn St, AF, Ohio St) hasn’t exactly been a murderer’s row. Should be another close, tight intense game, but who would expect less? That highlight does not get old! Just like Arike’s 3 pointer for the win. When they got possession of the puck, I was absolutely thinking, “OK, there might be just enough time to pot one, so let’s skate it up with some urgency.” And when it went to Cam, I was thinking, “Ooh. He might get a step on his man and knock one in.” Didn’t expect to score on the pass, but I saw the puck go into the net about a half a second (or more) before the red light went on. tUMD might have somewhat less of a home ice advantage than you would expect, as a fair number of Minnesota fans seem to prefer ND. Couple of really good UMD players to keep an eye on Joey Anderson (13) and Riley Tufte (27). Tufte is a monster 6’6″ 220lbs.